The game of croquet (pronounced “crow-KAY”) is a tradition of backyard recreation in America, as well as a sport that can be enjoyed by young and old alike. Whether you are a novice who plays the occasional friendly game or a determined competitor who gives opponents no quarter, you need to know the rules and have them handy for reference during a game. This special edition of the rules was prepared by the sport’s governing body, the United States Croquet Association (USCA), as a guide for informal backyard play. The following rules are suggested for use in play, as it is the purpose of the USCA to standardize one set of basic rules. For a two- or four-player, two-sided game, you need four balls. The colors usually used are blue, red, black, and yellow. One side (with one or two players) plays with blue and black, and the other with red and yellow. For a six-player team game, you need six balls. In team play, one side plays blue, black, and green, and the other side plays red, yellow, and orange. In “one-ball” games, you need one ball per player. Each player uses a mallet. Only the striking (end) face may be used to strike a ball, unless the players have agreed to allow the use of “side” shots or other shot-making variations. You can use colored clips or clothespins to mark the next wicket your ball must go through. The clip is picked up when a wicket is scored, then placed on the ball’s next wicket at the end of the turn. If the striker takes a swing at his/her ball and misses entirely, the miss counts as a shot and the turn ends, unless the striker had a second “bonus” shot. If the striker’s mallet accidentally hits another ball other than the striker ball, the shot must be replayed, but with no loss of turn. If a player plays out of turn, there is no penalty. Any ball moved during the out-of-turn play is replaced to its position prior to the error and play recommences properly. If an out of turn is initially condoned (not discovered) but then later discovered after other balls have been played, only the last ball played out of turn is replaced and the correct ball then proceeds. Example: if red plays, then blue plays, then yellow plays, yellow is replaced, and then red plays correctly. Each ball can score wicket and stake points for its side only by going through a wicket or hitting a stake in the proper order and direction. Going through a wicket out of order or in the wrong direction is not counted as a point gained or lost. A ball caused to score its wicket or stake during another ball’s turn earns the point for its side, but no bonus shot is earned as a result. A ball scores a wicket point only if it comes to rest clear of the playing side of the wicket. If a ball passes through a wicket but rolls back, it has not scored the wicket. If a ball travels backwards through its wicket to get position, it must be clear of the non-playing side to then score the wicket in the correct direction. Because wickets can be loose in the ground, it’s best not to run the side if the mallet head up or down either plane of the wicket. It’s always better to use your judgment sighting by eye. Scoring a wicket:<br /> A has not started scoring the wicket; B has. C has not finished scoring the wicket; D has. 1. From a mallet-head distance or less away from the ball that was hit (“taking a mallet-head”). 2. From a position in contact with the ball that was hit, with the striker ball held steady by the striker’s foot or hand (a “foot shot” or “hand shot”). 3. From a position in contact with the ball that was hit, with the striker ball not held by foot or hand (a “croquet shot”). 4. From where the striker ball stopped after the roquet. (If a boundary is in use and the striker ball went out of bounds, the ball should be measured in one mallet length from where it crossed the boundary). 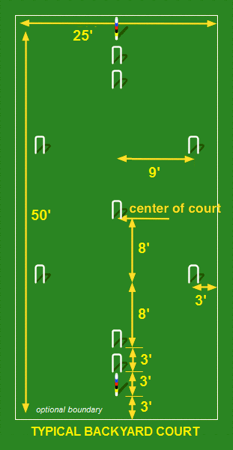 The second bonus shot after a roquet is an ordinary shot played from where the striker ball came to rest, called a “continuation shot”. If boundaries are established, whenever more than half of a ball (50%+) crosses the inside edge of a boundary, it is “Out of Bounds” and should be brought inbounds and placed one mallet length (or 36 inches) into the court. If players are using mallets of different lengths, agree to a common distance you’ll measure in during the game. The ball should be placed 90 degrees inbounds and perpendicular to the line and not diagonally from the line. (Exception: When the striker ball has just roqueted (hit) another ball, the striker may choose to place it in contact with or up to a mallet-head from the ball that was roqueted.) All balls are also immediately brought in a mallet length from the boundary when they are less than that distance from the boundary, except for the striker’s ball when the striker has an extra shot. If more than one ball crosses the boundary on the same spot, the striker may measure any ball inbounds first and then place the other(s) up to a mallet-head’s length away from it on either side. After a ball scores all of the wickets in the course, its player may choose to keep it in the game as a “rover” to help advance that side’s remaining ball(s) and to prevent the opposing side from advancing. 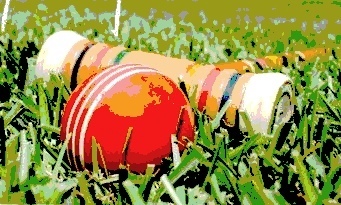 During this ball’s turn, it may hit any other ball only once per turn, gaining extra shots accordingly, but it does not earn any extra shots or wicket points for running a wicket. Any player may put a rover out of the game by causing it to hit the finishing stake. The rover’s side earns the point for the stake, and the order of play continues without the staked-out ball. If time does not permit a game to be played to the stake, a time limit may be set beforehand. A kitchen timer works well to alert players to the end of the time limit. When the time limit is reached the game is over. This is known as “sudden stop”. If the score is tied in the “sudden stop” format, the ball closest to its contested wicket gets an extra point for the win.